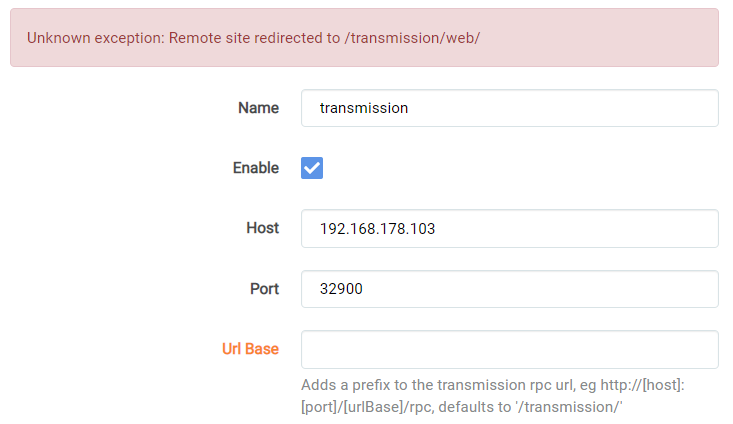 if i edit the download client entry i have for transmission i can see that the hint text for Url Base states that the default is ‘/transmission/’ which is what i had in there so i removed it. unfortunately that causes it to fail so i had to put it back in. is ‘/transmission/’ really the default or could it be just ‘transmission’ (without the slashes) - and my install doesnt use the /rpc part? transmission would probably work, but it’s much more common to prefix it with a slash (same as Sonarr’s own URL base is set with at least a leading slash). I don’t see a reason to change this, it’s the default that’s been there for years, it works unless you made a change to transmission to use a different URL base (or use a reverse proxy) and it’s an advanced setting (aka one that you probably won’t need to change unless you’re sure). Right, so you should just be using the default in Sonarr.